“Preacher Thanks the Lord for Car Parts.” That headline greeted me this week as I turned on my computer. Underneath the headline was this tagline: “Boogity, boogity, this pastor delivers one of the most unusual NASCAR pre-race prayers ever heard, plus makes a racy shout out to his wife.” Yes, he did as he thanked the Lord for the mighty machines about to race, for the Dodges, Toyotas, Fords, GM technology, Sunoco racing fuel and Goodyear tires. And then to top it all off, he gave thanks for his “smokin’ hot wife.” By the time his prayer was done the crowd was laughing. Defending his prayer later, Pastor Joe Nelms of the Family Baptist Church in Lebanon, Tennessee said he doesn’t want to pray “cookie-cutter” prayers and that he hoped his prayer would get somebody’s attention. Well, he succeeded in that. I guess the question is what kind of attention did he want? Some loved it, and others, like me, did not. 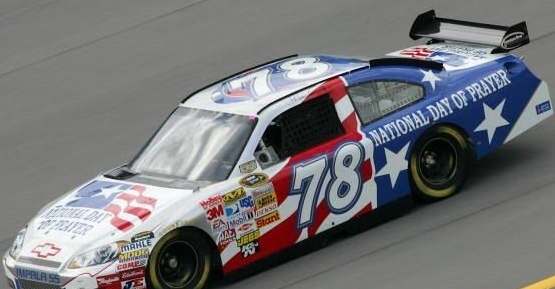 At least he closed his prayer “in Jesus’ name,” which is enough for some Christians to shout “Hallelujah!” for his boldness and take renewed hope that there are still some vestiges of Christianity alive and well in America, at least at the NASCAR track. This caused me to wonder why a pre-race prayer had to be offered up anyway. What’s the purpose? Is it to ask God to protect drivers from harm as they deliberately accelerate their cars to nearly 200 mph and take turns as fast as they can without skidding out of control or slamming into a wall? Is it for God to bless the crowd who has gathered on Sunday (a day I believe still has spiritual significance in Christian worship) at the raceway to watch these “mighty machines” roar around the track? Is it a prayer for everyone to have fun, as if that’s high on God’s list of priorities? If it is a prayer for God’s blessing, just what would a NASCAR blessing from God look like? You can tell I’m not a big NASCAR fan and I’m not saying there is anything wrong with going to a race. I’m just wondering what the prayer is about, even if it is offered in Jesus’ name. Why do we have to drag Jesus to the race? Is it just part of the “God & Country” gig? If so, do they serve apple pie afterwards too? I know a lot of people who would be upset and protest if the pre-race prayers were discontinued and cite it as one more evidence of our nation’s Christian decline. I would just say that if prayers like this at events like this are the measure of Christianity’s health in the USA, things definitely aren’t looking good and pre-race prayers aren’t going to help. This isn’t about supporting the false dichotomy many want to make between the sacred (i.e., church) and the secular (i.e., racetrack). It is about musing over the idea that God is not caught up with America’s entertainment addiction, and if I may put it this way, He has far more important things to attend to while we entertain ourselves to death. I think it wise to not try to validate our entertainment by attaching Jesus to it. “…after witnessing unrelenting ‘religion creep’ in big time sports — the infusion of a Wal-Mart theology shaped largely by the dictates of a money-grubbing sports establishment — I’ve come round to thinking that such prayers seem to be perfect for the occasion. Don’t get me wrong — I’m not against sports or having fun. I am against trivializing prayer and our faith. We can do better than this. No wonder the world mocks so much of contemporary evangelical Christianity if that is what we are offering up. I read another headline on my computer just below this story that linked to a video about a praying dog but I won’t go there. I will just rest my case. This entry was posted in Uncategorized and tagged Christianity, NASCAR, Prayer. Bookmark the permalink.